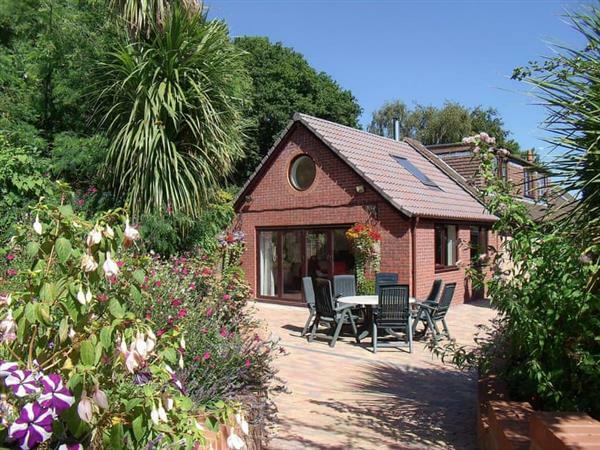 Woodlands in Langford Budville, near Wellington, Somerset sleeps 6 people. Woodlands near Wellington is a warm, spacious family property located in a rural area, just outside the village of Langford Budville in Somerset on the site of the owner’s garden/nursery, and has an adjoining 220-acre nature reserve. This semi-detached property is set between woodland and open countryside, with panoramic views to the Blackdown Hills in the lovely vale of Taunton Deane, on the Somerset/Devon border. Woodlands has everything you need for a family holiday. It is well equipped for children, with lots of children’s toys, CDs and videos, and even direct access to a shared playground with swings and slides. Guests can relax in the heated, outdoor 6-person hot tub in the garden, even in the winter time as it has a roof cover. Pure luxury! There is also a corner whirlpool bath in the main bathroom and showers in two of the en-suite bedrooms. Freshly baked cakes and cream teas with clotted cream and homemade jams, and tasty light lunches are served in the summer months in the small tea shop at the nursery gardens. The village pub is within walking distance with real ales, open fires and good food. Nearby places to discover include Tiverton with its castle and bustling old market, and a visit to Exmoor National Park is not to be missed either. Minehead and North Devon, with its sandy beaches, are within easy reach. The town of Wellington is close by, where an excellent range of shops can be found, and Taunton is within 10 miles. The city of Exeter is approximately 22 miles away, which is brimming with history and heritage, as well as many visitor attractions to keep you entertained for hours on end. From the magnificent cathedral to the historic quayside, there is so much to see and do in this fascinating city. The beach is 16 miles from Woodlands near Wellington. With the shop 3 miles, and the pub & restaurant are ½ mile from Woodlands. 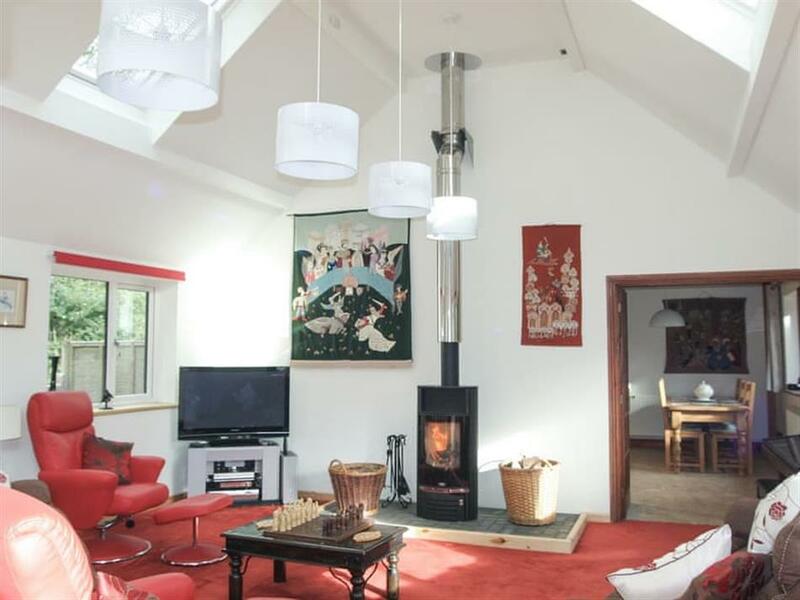 Living room: With wood burner, 50 Sky TV (full package), DVD player, electric keyboard and bi-folding doors leading to garden. Kitchen/dining room: Farmhouse style with range with double electric oven and gas hob, microwave, fridge, freezer, dishwasher, coffee machine, washer/dryer, beams and tiled floor. Bedroom 1: With four poster double bed, 20 Freeview TV, DVD player and en-suite with step to shower cubicle (no toilet). Bathroom: With corner whirlpool bath, toilet, heated towel rail and tiled floor. Bedroom 2: With king-size bed, 50 Freeview TV, DVD player and en-suite with shower cubicle (no toilet). Bedroom 3: With twin beds and TV (for video use only). LPG central heating, gas, electricity, bed linen, towels and Wi-Fi included. Initial fuel for wood burner included. Travel cot, highchair and stairgate. Welcome pack. Enclosed lawned garden with patio, garden furniture and barbecue. Hot tub for 6 (private). Children’s play area (shared). Private parking for 3 cars. No smoking. Holidays at Woodlands run from Monday to Monday. For a better idea of where Woodlands is, you can see Woodlands on the map below. Woodlands is in Somerset; should you be on the lookout for a special offer, you can find all the special offers in Somerset. It's always worth checking to see what is on offer at the moment. Do you want to holiday near Woodlands (UK10365), you can see other cottages within 25 miles of Woodlands; have a look to find your perfect holiday location.